Team Sky cleaned up in the Tour de France 2018 prize money list. With the biggest prizes for the general classification, it’s no surprise the team with two men on the podium romped home with the most cash. At the end of the Tour, Team Sky are way ahead in the prize money list. They won almost three times as much as the next best; Team Sunweb. Geraint Thomas and Chris Froome were 1st and 3rd overall. And Thomas won two stages. That helped Team Sky to a total of €726,630 in prize money. And that’s just under €91,000 for each of the men on the team; if the cash is split evenly between those who started. However, Gianni Moscon was sent home. 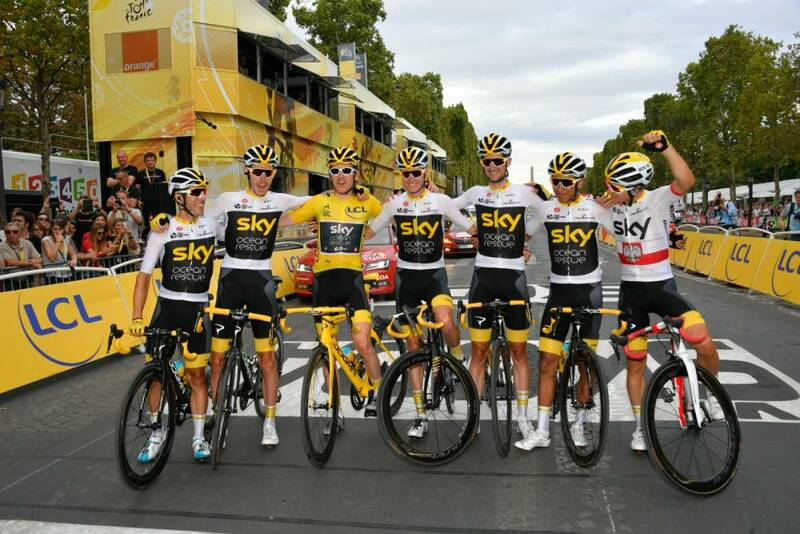 And it is possible Froome and Thomas would forego their cash and give it up for the team. In the past, some teams have also shared the cash they’ve won with staff; not just the riders. For winning the race overall, the prize is €500,000. Tom Dumoulin (Team Sunweb) wins €200,000 for his runner-up spot. And Froome’s final spot on the podium is worth just €100,000 – you can see full breakdowns in the images below. It means the vast majority of Team Sky’s winnings came from the podium placings. The two stage wins by the final yellow jersey were also worth €11,000 each. Between them, Froome and Thomas were either 2nd or 3rd six times; worth €5,500 and €2,800 respectively. In the overall; placings 21st to 160th carry a prize of €1,000 per rider. 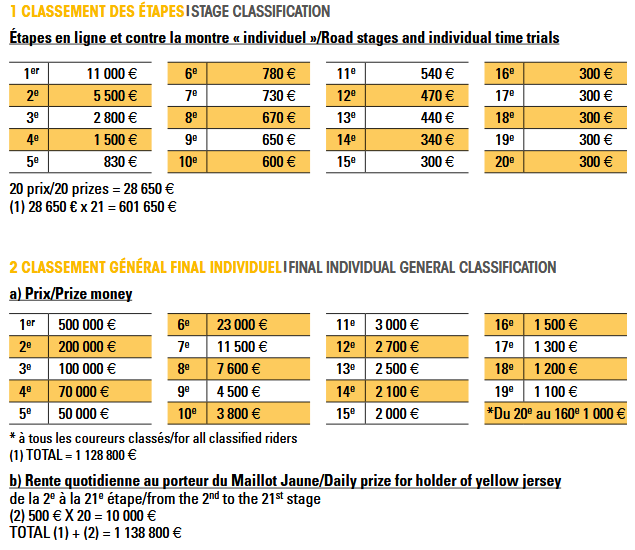 And on each stage there are cash prizes for the top 20; down to €300 for 20th. The points classification and climbers’ classification are each worth €25,000, €15,000 and €10,000 for the top three. Those prizes go down to €2,000 for 8th in the competitions. And the top three on each intermediate sprint get €1,500, €1,000 and €500. 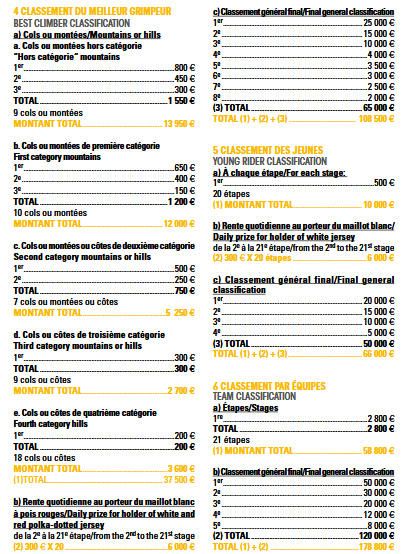 The top three prizes for each HC climb are €800, €450 and €300. Cat 1 climbs have prizes of €650, €400 and €150. Cat 2s offer €500 and €250; cat 3s and 4s offer €300 and €200 for first to the top only. 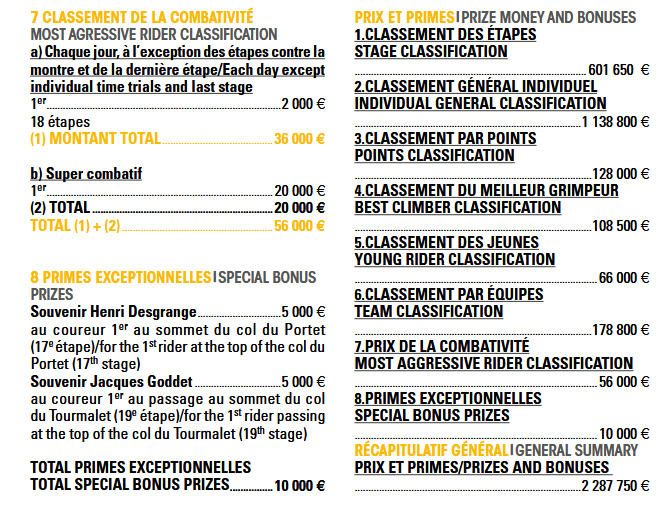 Each day a most aggressive rider is awarded and the prize is €2,000. The overall winner of that category – Ireland’s Dan Martin this year – wins €20,000. 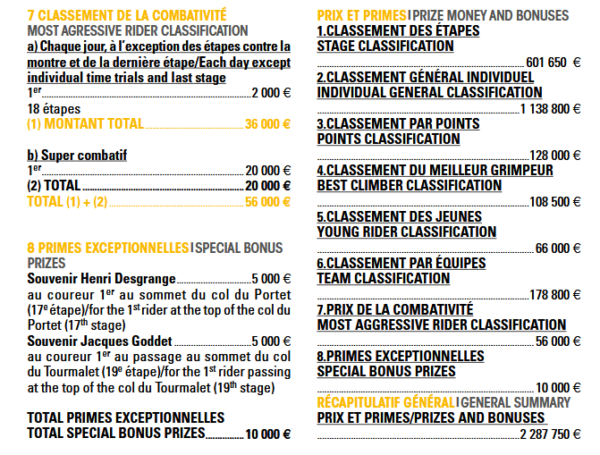 The best young rider on each stage gets €500 while the holder of the white jersey on each stage gets €300. And the winner of the overall – Pierre Latour of AG2R-La Mondiale – gets €20,000. The top three teams overall get €50,000, €30,000 and €20,000. And being the best team on one stage nets €2,800. Next on the list after Team Sky; Team Sunweb takes home €245,280. Then comes LottoNL-Jumbo, with €190,980, and QuickStep on €145,070. Peter Sagan’s Bora-hansgrohe won €125,900 and Movistar take €114,620 out of the race. Dan Martin’s UAE Team Emirates are next; in 7th place of the 22 teams. The Irishman’s team won €100,650 during the three week race. Martin’s 8th overall was worth just €7,600. The lowest earners were EF Education First-Drapac, winning just €14,420.